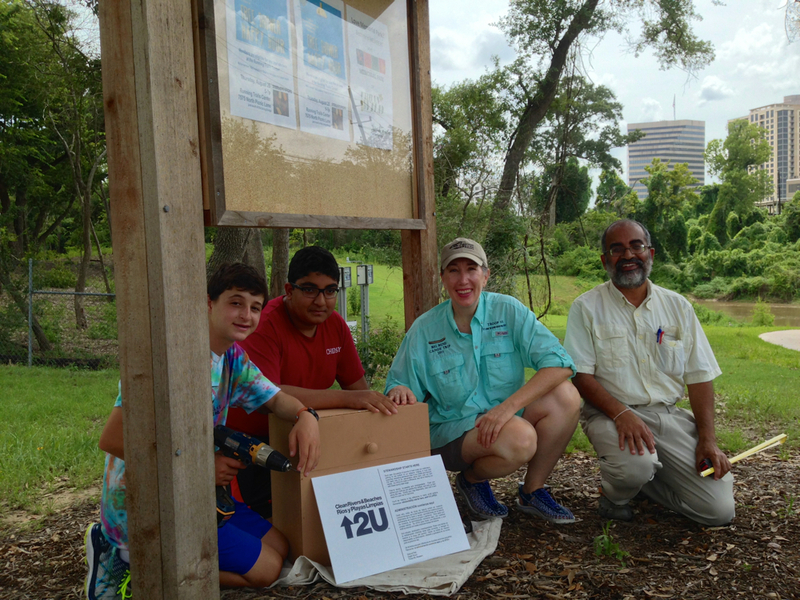 Houston Boy Scout Saswat Pati, a member of Sam Houston Area Council Troop 55, has built and installed wooden boxes to distribute reusable mesh bags for collecting trash on Buffalo Bayou and Spring Creek. The project is part of a statewide project started by the Nueces River Authority called Up2U. Pati, a sophomore at St. John’s School in Houston, planned and executed the garbage bag project on Buffalo Bayou as part of his service requirement for obtaining the rank of Eagle Scout. The wooden boxes have now been installed at four locations, including two on the 26-mile long Buffalo Bayou Paddling Trail established by the Texas Parks and Wildlife Department, which is the official beneficiary of the service project. The two Buffalo Bayou locations are Briar Bend and Woodway. Officials with Harris County Precinct 3 refused to allow Pati to install boxes at the four Paddling Trail boat launches in Terry Hershey Park. In fact, county maps of Terry Hershey Park do not show any boat launches in the park. Terry Hershey Park, named for conservationist and bayou preservationist Terry Hershey, is in Harris County Commissioner Steve Radack’s Precinct 3. However, in cooperation with the excellent Bayou Land Conservancy, Commissioner Jack Cagle did allow Pati’s garbage bag boxes to be installed at two locations on Spring Creek in Precinct 4. Those two locations are Pundt Park and the Jesse H. Jones Park and Nature Center. Precinct 4 also includes Buffalo Bayou as it flows past Memorial Park. Installing a handbuilt wooden box for reusable mesh bags to collect trash on Buffalo Bayou. At the Woodway boat launch in Memorial Park, part of the Texas Parks and Wildlife Buffalo Bayou Paddling Trail. From left to right: Boy Scouts Jonah Pesikoff and Saswat Pati, Assistant Scoutmaster Janice Walden, and Boy Scout Dad Debananda Pati. Citizens concerned about our forests on Buffalo Bayou will want to attend the annual District G Capital Improvement Plan meeting tomorrow evening, March 3, 2016. The meeting starts at 6:30 p.m. in the Stratford High School Auditorium, 14555 Fern Drive, and features the district’s new city council member, Greg Travis, who was elected to City Council District G last November. Capital Improvement Plan meetings “afford citizens an opportunity to learn, voice their concerns and address their respective City Council Members and City of Houston officials regarding project planning and delivery,” according to a statement on Travis’ website. District G extends along Buffalo Bayou from Shepherd Drive to Barker Reservoir in far west Houston. “We now have a new city council representative, a new mayor and a new [Public Works and Engineering] director since we began our campaign to Save Our Forest,” wrote community activist George Crosby in an email. “It is important that they know how much you care about Buffalo Bayou. 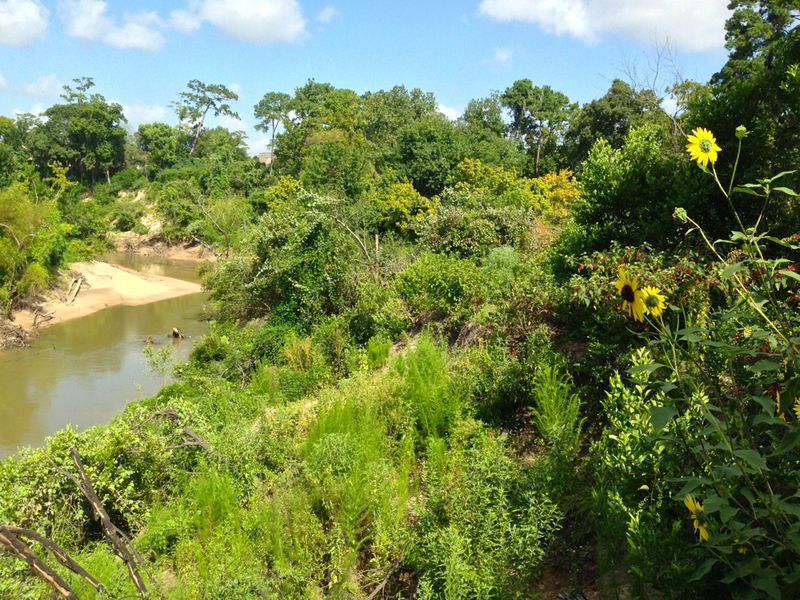 The banks of Buffalo Bayou in Terry Hershey Park in West Houston. Straightened and channelized by the Army Corps of Engineers in the 1940s to speed storm waters, the bayou has since restored itself but remains threatened by public projects to build detention basins. 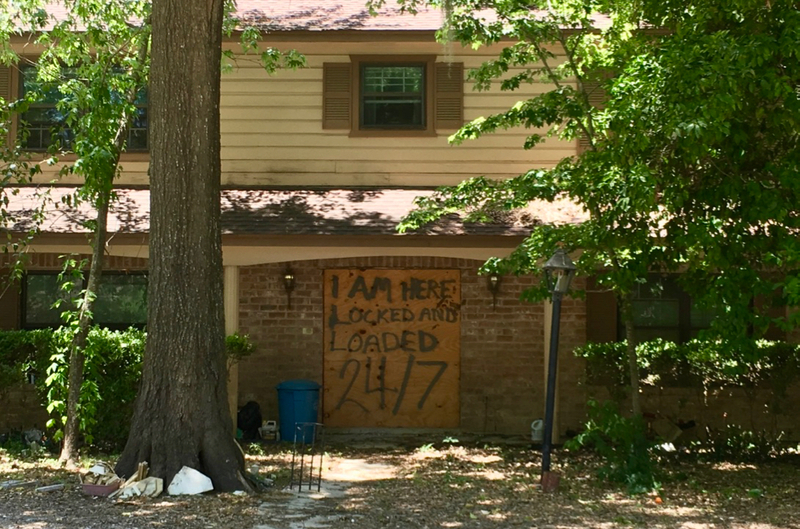 “Last year there were two major rainfall events which caused structural flooding in Houston. Regional detention alternatives that can reduce local flooding without having to destroy the forested areas of Buffalo Bayou are not happening. Cooperation between the City, County and Federal governments is required for a successful regional detention initiative. “A cooperative inter-governmental effort begins with the City of Houston understanding our support for this approach. 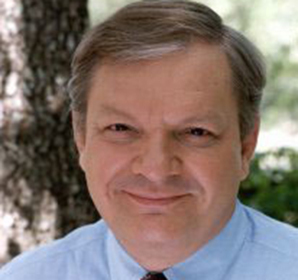 Please help us give emphasis to Save Our Forest,“ wrote Crosby. 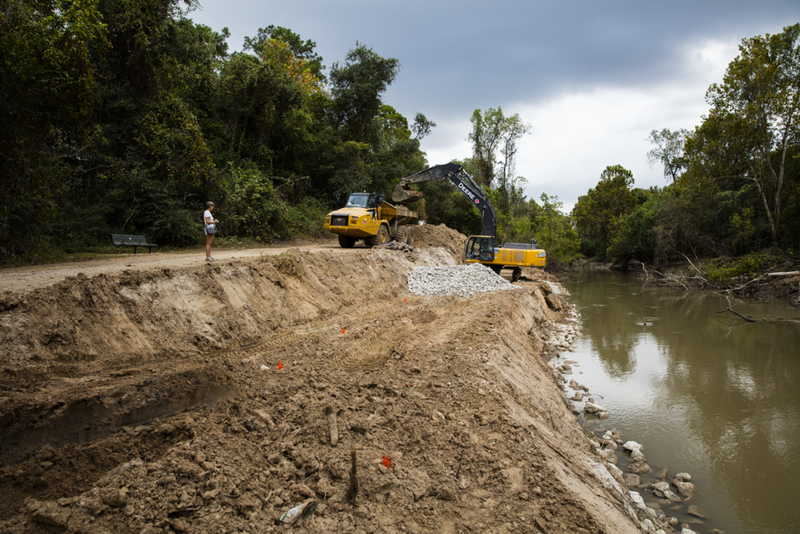 The public forests of Buffalo Bayou are still threatened by a Harris County Flood Control District plan to build some 24 detention basins on both banks of Buffalo Bayou in Terry Hershey Park. The flood control district is also waiting for a federal permit to raze the forest along more than 1.25 miles of one of the last natural stretches of the bayou as it flows past Memorial Park and the Hogg Bird Sanctuary. It makes no scientific sense to destroy forests to create detention basins. Forests provide valuable natural detention by slowing, absorbing, and deflecting rainwater, in addition to many other valuable ecological services, including cleansing and filtering the water and protecting against erosion. In October of 2015, the Obama administration issued an executive order directing all federal agencies to incorporate the value of ecosystem services in their decision-making. The Harris County Flood Control District, according to its 1937 charter, is charged by state law with conserving forests in the county. (See page six.) But for decades the district has been razing forests to build storm water detention basins on our bayous, creeks, tributaries, and elsewhere, and to re-engineer channels and banks. Detention basins are used to hold or slow temporarily surface runoff or high flows in a stream during storms. The flood control district’s project on Buffalo Bayou in Memorial Park, known as the Memorial Park Demonstration Project, would raze some 80 percent of the trees and vegetation along more than 1.25 miles of the bayou and its tributaries in Memorial Park and the Hogg Bird Sanctuary. The Army Corps of Engineers, which enforces the federal Clean Water Act, is currently considering whether to issue a permit for the controversial $6 million project, which is described by flood control as an “erosion control” and “bank stabilization” project. 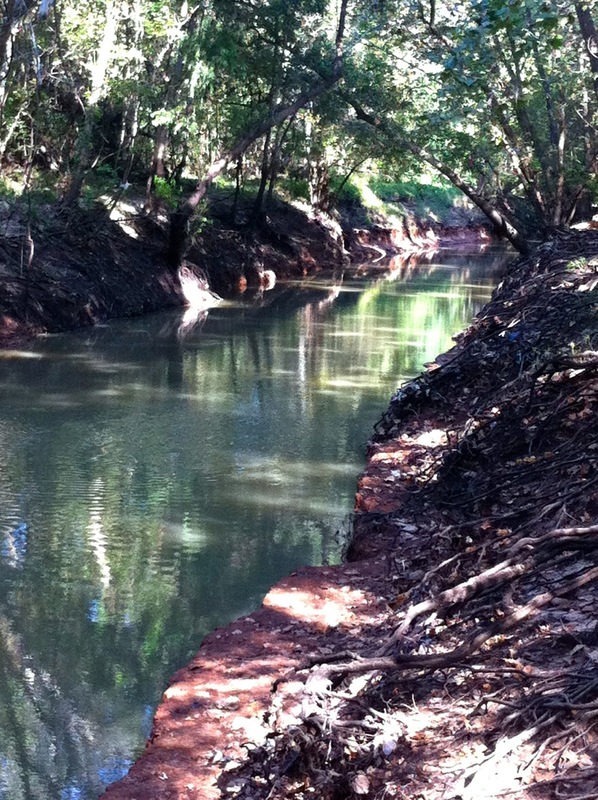 The project violates Best Management Practices for riparian areas. Virtually every federal and state resource agency has policies and regulations protecting riparian zones, which perform essentially the same function as federally-protected wetlands. The City of Houston recently withdrew a project to cut down the majority of trees and understory on some 42 acres of public forest and excavate up to six large detention basins on the south bank of Buffalo Bayou in Terry Hershey Park between Beltway 8 and Wilcrest Drive. The Capital Improvement Project was to have cost the taxpayers between $3.5 and $8.5 million. However, the flood control district appears to be continuing with its widely-opposed “Charting Buffalo” study that proposes as many as 24 storm water detention basins along some 10.7 miles of both banks of Buffalo Bayou in the forests of Terry Hershey Park between Beltway 8 and Highway 6 at Barker and Addicks dams. On Nov. 12, 2013, despite public opposition, Harris County Commissioners Court approved flood control’s request for $250,000 for a vegetation and topography survey in the park. The headwaters of Buffalo Bayou are on the Katy Prairie west of Houston, and the 18,000-year-old “mother bayou,” fed by numerous tributaries, flows for some 53 miles east through the city and the ship channel into Galveston Bay. Buffalo Bayou, unlike major bayous like White Oak and Brays, which join Buffalo Bayou just west and east of downtown, has never been covered with concrete, though parts of it have been channelized.